Christopher C. Fry - O'Connor & Thomas, P.C. Christopher C. Fry was born and raised in Cedar Rapids, Iowa. He graduated from Luther College in 2001 with a Bachelor of Arts degree in Communications and was also a 4-year member of the track and field team. He obtained his Juris Doctorate from the University of Iowa in 2004. He joined the firm in 2004, upon admission to the Iowa Bar. Chris is a member of the American, Iowa, Wisconsin, and Dubuque County Bar Associations. He was admitted to practice in Wisconsin in 2012. He is also admitted to practice before the U.S. District Court and Bankruptcy Court for the Northern District of Iowa, and U.S. District Court for the Central District of Illinois. Chris is also a member of the Iowa Academy of Trial Lawyers. Chris has a general practice which includes, but is not limited to the areas of business law, criminal law, insurance, personal injury, workers’ compensation, labor and employment, litigation, trial law, and appellate practice. 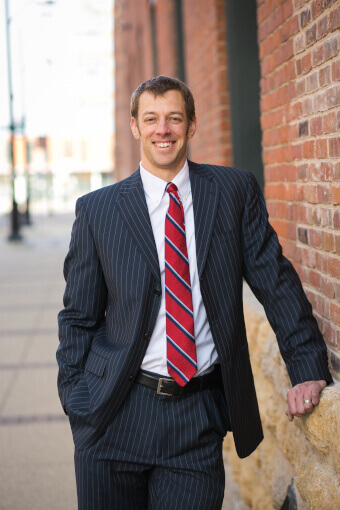 Christopher C. Fry was selected as one of the Top 40 Under 40 Litigation lawyers in the State of Iowa for 2015. The determination of the need for legal services and the choice of a lawyer are extremely important decisions and should not be based solely upon advertisements or self-proclaimed expertise. This disclosure is required by rule of the Supreme Court of Iowa. Memberships and offices in legal fraternities and legal societies, technical and professional licenses, and memberships in scientific, technical and professional associations and societies of law or field of practice does not mean that a lawyer is a specialist or expert in a field of law, nor does it mean that such lawyer is necessarily any more expert or competent than any other lawyer. All potential clients are urged to make their own independent investigation and evaluation of any lawyer being considered.This notice is required by rule of the Supreme Court of Iowa.The information you obtain at this site is not, nor is it intended to be, legal advice. You should consult an attorney for individual advice regarding your own situation.